Vehicle Financing and Subprime Car Loans – Frequently Asked Questions! 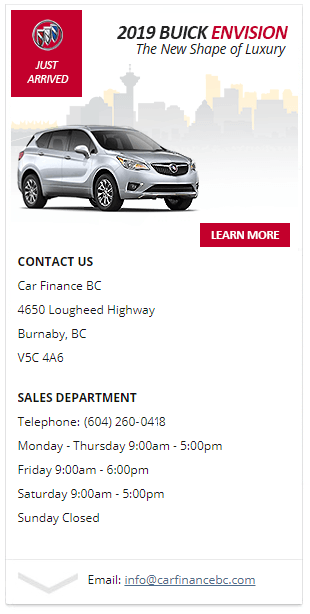 Why Car Finance BC in Burnaby? Large selection of inventory (fully stocked) inventory of over 1,100 (new and pre-owned) vehicles to choose from (via our Carter Auto Group) including; Sedans, SUVs, Compacts, Trucks and Commercial Vans. When it comes to choice and flexibility – our financing programs are designed with our customers in mind! Our dedicated team of qualified leasing specialists work diligently to secure our customers vehicle of choice – while catering closely to all individual budgetary requirements. Learn more about our tailored Vehicle Finance plans today. With our decades of experience, Car Finance BC is able to provide our customers with highly competitive finance rates and terms through a variety of different lenders. Family owned and proudly Canadian – with our extensive experience, vast knowledge-base and the network to deliver vehicles anywhere in Canada. Is it possible to receive a car loan with bad credit? Unsurprisingly, this is fairly common question and one which is often misinterpreted in general. While many financial institutions will heavily scrutinize the history of your credit and penalize you for whatever they find, the prospect of receiving a car loan with Car Finance BC can be significantly more favourable. Simply put, financial institutions need to do business, and with such a large proportion of the population having tarnished credit, this provides a very large target market for the loan provider. In fact, recent studies showed that more than one-third of the population in Canada is considered to have less than favourable credit. Possess a valid drivers licence? What types of credit considerations do you work with? Believe it or not, mistakes do happen, and your bad credit rating is always susceptible to human error. Before applying for a car loan, it’s often worth researching the details within your credit history to ensure there are no inaccuracies involved. Remember that every inaccuracy will contribute to the extent of your bruised credit and one example of human error can be the difference between loan approval and disappointment. Applying for a subprime vehicle loan is much the same as a standard vehicle loan. In this sense, our customers are required to provide relevant documentation such as government issued identification (drivers license and social insurance information) employment details, banking records, and the actual finance application. Our trained credit specialists work alongside several financial institutions to provide a quick and easy application submission. Having had time to fully check every aspect of the application, the lender will decide on the eligibility of an applicant for the vehicle loan. How to calculate a realistic repayment structure? Arriving at a meeting having done no research or planning will have one result – failure! At Car Finance BC in Burnaby we provide our customers with a clear understanding of all obligations and requirements for car loan payments – moving forward. Reputable car dealerships are just as trustworthy or reliable as a financial institution, but the one you decide upon will often come down to which one offers the most suitable requirements. The best approach for customers with less than favourable credit? With all of the above in mind, the best way to approach a car loan with any provider is to act with honesty, transparency and good faith. Car Finance BC works closely with all our client’s to ensure they receive the vehicle they want… the vehicle they deserve (at a price which is most economical to our customers). Which financial institutions and lenders do you work with?